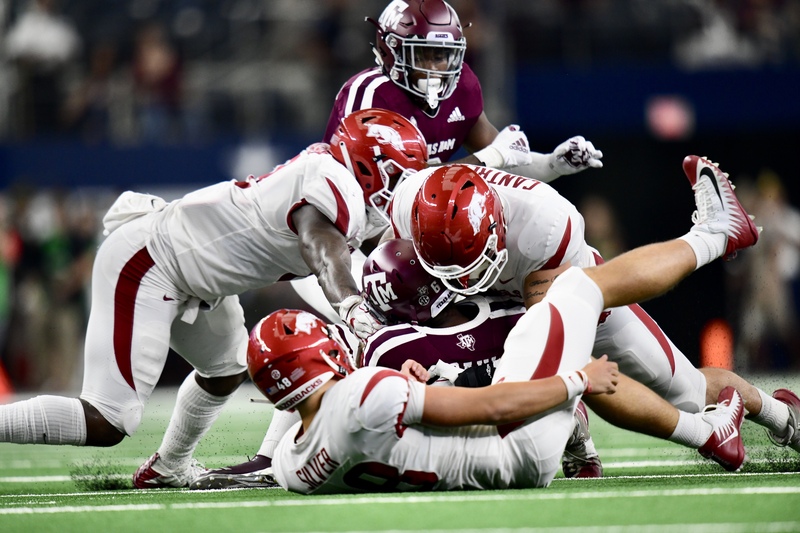 DALLAS – Despite another strong effort from the Razorback defense, a late turnover ended the Razorbacks fourth-quarter comeback attempt as Arkansas (1-4, 0-2 SEC) fell 17-24 to Texas A&M (3-2, 1-1 SEC) at AT&T Stadium in Dallas. On 2nd and 5, Dre Greenlaw made his first interception of the season to give the Razorback offense field position in Aggie territory. On 3rd and goal from inside the 1-yard line, Cole Kelly ran the ball for a touchdown to put Arkansas on the board. Dre Greenlaw recorded his second interception of the game at the Texas A&M 23. Connor Limpert’s 47-yard field goal to open the 3rd quarter put the Razorbacks within one touchdown of the Aggies. A 29-yard pass from Ty Storey gave Mike Woods his first touchdown of the season.